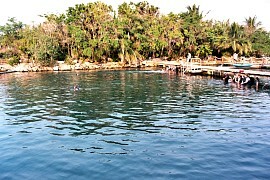 Our children swim with the dolphins. 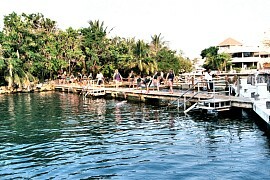 We signed the kids up to swim with the dolphins at Puerto Aventuras. 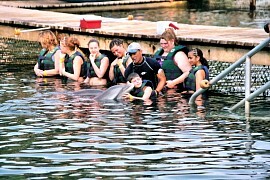 Younger kids can 'interact' with the dolphins, or for older kids they can get out and swim. 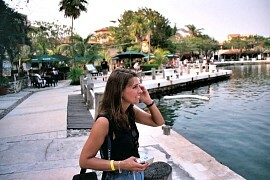 Initially they told us our nine year old couldn't participate in the swim. But because his older sister was 19 they let him go with her. Before getting into the tank the kids had to watch a 10 minute movie about dolphins and the trainer told the kids they had to cheer the dolphins on because they enjoy the praise. Megan said the dolphins smelled 'salty' and felt 'rubbery'. 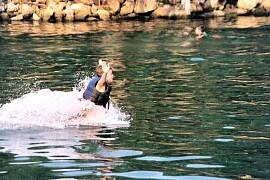 When the humans moved their hands back and forth the dolphins would respond by making clicking noises. 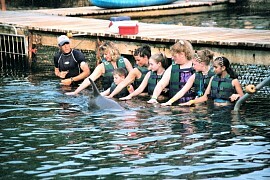 Here everyone holds out their hands and gets to touch the two dolphins as they swim by. 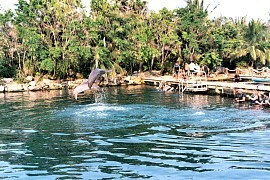 These dolphins were named "Estephan" and "Geocondira". The trainer blew his ultrasonic whistle and make signals under water with has hands and in response the dolphins swam off quickly and jumped in the air. They each got a fish reward for doing this. The reward fish were only about 4 inches long. The kids each got a chance to kiss a dolphin. Again, Megan said they tasted salty and smelled salty. You can't really see their teeth. 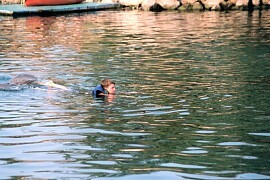 The next activity for each participant was to swim out from the dock and lay on your stomach with your legs out behind you on the surface of the water. This picture shows the dolphin locating Alec's foot so he can push on it. The trainer reminds each child to lock their knees when the dolphins come up behind them. Here is Alec on his "nose push" - all the kids really enjoyed this. Because the children enjoy this, so do the parents!